Jesse Lee Petty a.k.a. The Silver Fox (November 23, 1894 in Orr, Oklahoma – October 23, 1971), was a professional baseball pitcher in the major leagues from 1921 to 1930, for the Cleveland Indians, Brooklyn Robins, Pittsburgh Pirates and Chicago Cubs. 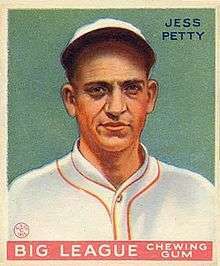 He managed in the minor leagues in 1935 and 1936 for the Knoxville Smokies of the Southern Association and the Hopkinsville Hoppers of the Kentucky–Illinois–Tennessee League.